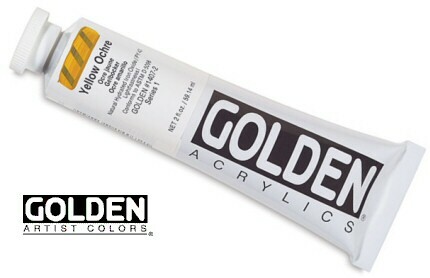 Recognised as the leading acrylic for artists Golden Heavy Body Acrylics have an exceptionally smooth, rich and buttery consistency. The paints have the ability to stand up and retain brush strokes or palette knife marks on the canvas. Heavy Body Artist Acrylics also contain the largest assortment of unique pure pigments in a 100% acrylic emulsion vehicle available to the professional artist. They contain no fillers, extenders, opacifiers, toners, or dyes. Since Heavy Body Acrylics contain no additives, such as matting agents, the gloss of each color will be different. Importantly, the Heavy Body Acrylics retain excellent flexibility when dry, greatly diminishing the possibility of cracking that occurs in other natural and synthetic polymer systems. They also can absorb the constant stress and strain placed on canvas when it is shipped, or as it expands and contracts with changes in temperature and humidity. To order single colours simply enter the number of each colour you require and then press the add to order button at the bottom of the page.